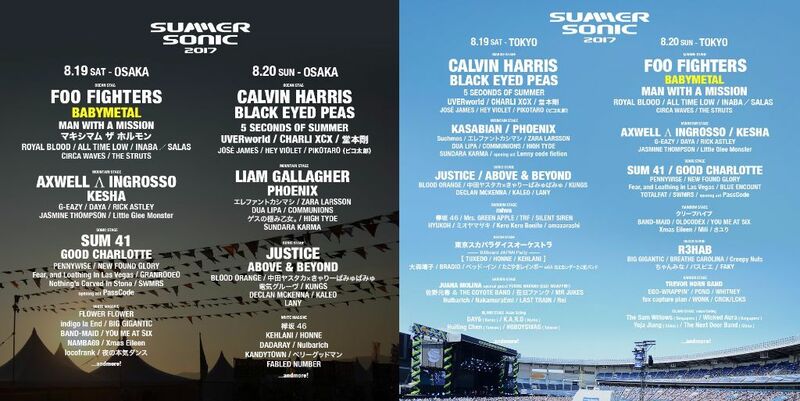 Concert series Summer Sonic is back and this year will be bigger than ever! It has been announced that metal-idol band BABYMETAL will appear at “SUMMER SONIC 2017” as the second headliners after American rock band Foo Fighters. BABYMETAL have been on their come up since they first formed in 2010 as a subunit of idol group Sakura Gakuin. In 2012, they were the youngest band to play at Summer Sonic…playing the stage adjacent to the food court. Since then, they have performed at the yearly festival in some capacity and worked their way through the ranks of the music industry both domestically and internationally. Beginning in 2000, The Summer Sonic Festival is an annual two-day rock festival held at the same time in Osaka and Chiba (the majority of the bands playing in Osaka the first day go to Chiba the following day and vice versa). The line-up contains many Japanese rock musicians from both major and indie record companies as well as international acts. Featuring some of the biggest acts from around the world, previous headliners have included Coldplay, The Strokes, Radiohead and Underworld. Also performing, Japanese acts announced are UVERworld, Tsuyoshi Domoto, Pikotaro, and Keyakizaka46, to name a few. International acts this year include Phoenix, Charli XCX, Liam Gallagher, Justice and the return of Kesha. That’s just a taste of what’s to come, check out the full confirmed list below! Summer Sonic 2017 will be held from August 19 to 20 in Chiba and Osaka.